Tucson Man Harvests Rainwater It doesn't rain that much in Tucson, Ariz., but when it does, Brad Lancaster makes use of every drop. Lancaster has perfected the art of capturing and saving rainwater. It doesn't rain that much in Tucson, Ariz., but when it does, Brad Lancaster makes use of every drop. Lancaster has perfected the art of capturing and saving rainwater. Coming out of the monsoon season in Arizona, we make a return visit to one person who's been loving the dark clouds, the Rainman. That's how people in the mostly parched city of Tucson think of Brad Lancaster, a tireless proselytizer for harvesting water. NPR's Ted Robbins joined him under the pouring skies. TED ROBBINS: The tall, thin evangelist with a red beard doesn't have to pray for rain. Mr. BRAD LANCASTER (Rainwater Harvester): Yeah, a wonderful summer monsoon downpour that's flooded the streets and is filling the tanks. ROBBINS: Brad Lancaster preaches salvation from the heavens in the form of water. It's coming down in buckets, in two buckets all over his yard and into a 1,200 gallon cistern on the side of his house in Tucson, a place which receives on average, just 12 inches of rain a year, half of which come in torrents during the three summer months. Mr. LANCASTER: And we're directing the overflow water from that and any runoff from the pathways and patios into adjoining planting basins. ROBBINS: So rather than getting - trying to get rid of the water, you're trying to keep it. Mr. LANCASTER: Absolutely, yeah. This is the harvest season. ROBBINS: Brad Lancaster has two books and a Web site devoted to rainwater harvesting. Now rainwater harvesting is as old as civilization, but it's been largely forgotten as we developed pumped-piped water systems. Brad Lancaster's crusade is to bring back the ancient methods. Mr. LANCASTER: By taking up the chant of slow it, spread it, and sink it. ROBBINS: And he wasn't about to stick to his own property. He planted trees next to the street in dirt basins which use gravity to catch water running towards storm drains. Mr. LANCASTER: The bottom of the basins are lower than the streets. So now when the water flows along the curb, it enters the dip, fills up the basins. ROBBINS: Which overflow into other basins down the street. Mr. LANCASTER: When we first did it, it wasn't legal. ROBBINS: Now, thanks to Lancaster's lobbying, all it takes is a permit. So he got his neighbors to do it. They made cuts in the pavement and planted native trees every 20 feet or so. He says it brought the neighbors together, and more. 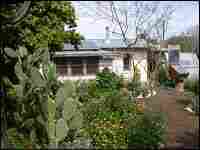 Mr. LANCASTER: It also beautifies the neighborhood, cools the temperatures in summer, and produces food because we eat the mesquite pods off the mesquite trees, the palo verde seeds and flowers, and the peanut-flavored desert ironwood seeds. ROBBINS: Brad Lancaster wants everyone to slow, spread, and sink the water. And he says anyone can do it. Mr. LANCASTER: I think it's a snap. All you need to do is to get a shovel and start moving some dirt. ROBBINS: Lancaster helped persuade the Arizona legislature to pass a state tax credit for homeowners who install water conservation systems. He says he'll keep his crusade going in the Southwest, the Southeast, the plains, anywhere where rainwater is rapidly going down the drain instead of slowly sinking into the ground. Ted Robbins, NPR News, Tucson. Brad Lancaster's garden in Tucson, Ariz., features landscaping that takes advantage of rainwater and runoff from the adjoining street and path. 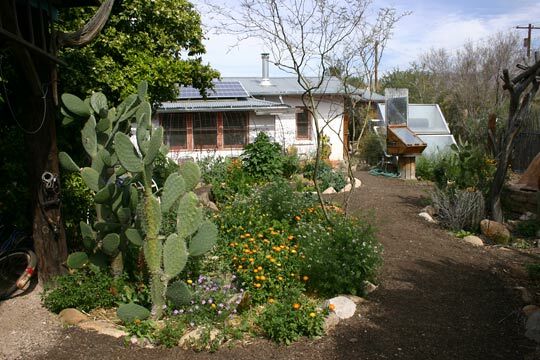 His home features solar panels, a solar water heater and homemade solar oven. Brad Lancaster's property, at the time of purchase in 1994. Most runoff drained off the site, up against the home, or through the garage. All potentially reusable "graywater" from household drains went down the sewer, and a palm tree blocked winter solar access. 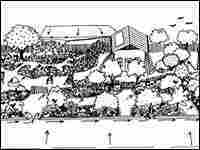 An illustration of Lancaster's property in 2006 shows that no runoff leaves the site. 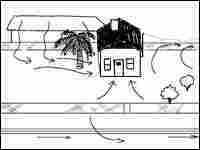 Street runoff is directed to basins and trees along the curb. All graywater is directed to and recycled within the landscape. With palm trees removed, winter solar access is regained. 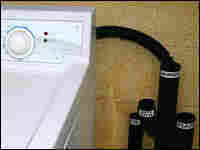 "Graywater" drains (marked with destination: fig, white sapote, orange, and peach trees) beside a washing machine. 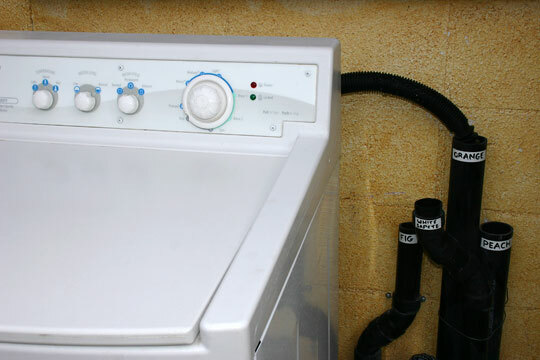 The washer's drain hose is placed in a different pipe with each load of laundry. Big rains slammed the West this week — big news in a region that has gotten used to dry weather. Now some city governments are looking to rain to ease their water woes. Thousands of years old, the concept is catching on in drought-prone areas, including Tucson, Ariz., where Brad Lancaster lives. He's the author of Rainwater Harvesting for Drylands and Beyond. As Lancaster explains, harvesting rainwater means to "capture the rain as close as possible to where it falls, and then to use it as close as possible to where it falls." The easiest method is to use the soil to capture the rainwater. "You create these bowl-like shapes in the landscape that collect water. You mulch the surface and plant them so the water quickly infiltrates, and then the plants become your living pumps." "So you then utilize that water in the form of a peach, a pomegranate, an apple, wildlife habitat and beauty," Lancaster tells Renee Montagne. A second, better-known version of rainwater harvesting is collecting rainwater from a roof in a tank, or a cistern. Household wastewater is "an excellent source of rainwater that we can reuse to passively irrigate our landscapes in times of no rain," Lancaster says. Lancaster says that 30 percent to 50 percent of potable water consumed by the average single-family home is used for landscaping. But nearly all of the irrigation water needs can be met just with rainwater and graywater, he says. Rainwater harvesting can be useful even in areas that are not affected by drought, helping reduce flooding downstream, for example, Lancaster says.